Justin Paxton of Lambertville, MI appeared to be on his way to his second UMP Late Model Feature of the year at Oakshade Raceway on Saturday night after building a straightaway lead over the rest of the competitors. Country Charm Cafe in Metamora, OH put up lap money for all of the evenings feature race lap leaders. Paxton took most of that money in the UMP Late Model Feature leading 24 of the 25-lap event. Rusty Schlenk worked his way up to second and then had to make up a lot of race track to mount a challenge on Paxton. That was exactly what he did, wheeling his car through lapped traffic until he caught the 34 car of Paxton. Paxton was caught behind a group of soon to be lapped cars that were racing each other fairly hard as the white flag flew setting up a dramatic finish. Schlenk tried to stick his car to the inside going into turn three for the final time. Paxton, feeling the pressure, had to make a move on the slower traffic in front of him to try to hang on the the lead, but contact with Josh Steinacker slowed Paxton just enough to allow Schlenk to get alongside coming off of turn four. With no traffic on the inside, Schlenk powered off turn four in a drag race to the checkered flag with Paxton having to negotiate slower traffic on the outside. 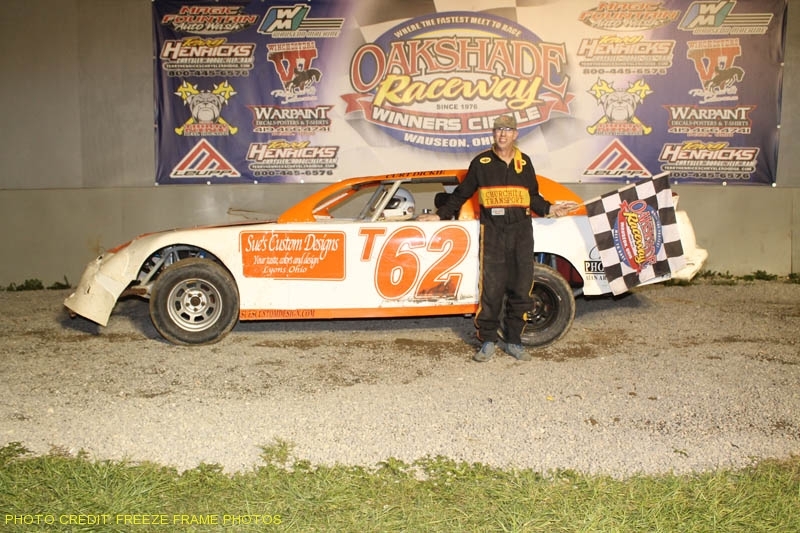 Schlenk made up an impressive deficit without the aid of any caution flags to capture his fifth UMP Late Model Feature win of the year at Oakshade Raceway. Paxton settled for a second place finish with Hillard Miller ending up third after starting 12th. Rody Schroyer was fourth and Zack Olger was fifth. Bruce Stuart had a problem at the beginning of the UMP Sportsman Feature and was slow at the drop of the green flag after starting on the pole. The field stacked up behind him and eventually ended up in a big pile up in turn two. Many cars involved pitted and made it back out to the track before the complete restart. Ray Klawitter led the first lap back under green with Josh Steinacker closing. Steinacker took control by lap two, but Klawitter kept the pressure on for a few laps until Steinacker began to extend his advantage. Steinacker went on to pick up the easy victory which was the third consecutive UMP Sportsman Feature win for the Grass Lake, MI driver. Brian Fisher held off Rusty Schlenk for a second place finish and Schlenk settled for third after starting near the back of the field and avoiding the first lap pile up. Klawitter slipped back to finish fourth followed by Joe Derbeck. Ron Tolles jumped out to the lead in the Bomber A Main after starting on the outside of the front row. Tom Ordway started right behind Tolles and began to put the pressure on for the lead. Ordway took over the top position by lap four with Jake Rendel closing in quickly. Rendel made the move on Ordway to take the lead by lap six. Ordway hung with Rendel for most of the remainder of the race, but Rendel had the car to beat as he went on to post his fourth A Main win of the year which further tightens an already close Bomber points race between Ordway, Rendel and Jim Scout. Craig Dippman finished third behind Ordway with Ron Tolles and Garry Domoe finishing fourth and fifth respectively. Scout had back luck earlier in the night and had to start 20th in the feature but ended up salvaging a seventh place finish. Karl Spoores and David Goben raced side by side for the lead in the early running of the Bomber B Main until Spoores slipped up a bit in the corner. Goben took over the lead but then felt some heat from Chris Williams, Jarrett Rendel and B.J. Gregory. Spoores closed back in on the leaders and then lost control coming off turn four. His car came to a stop in the infield at the end of the front stretch which brought out a caution. Williams went on to hold off Gregory and Rendel for the win. Roger Davenport started 16th and ended up fourth followed by Bob Rendel in fifth. Goben slipped back to finish sixth. Billy Garland led early in an action packed Bomber C Main that featured a slew of different race leaders. Jeff Krotzer got into Garland while racing for the lead and spun Garland to take over the race lead. A short while later, Josh Overmyer overtook Krotzer for the top position, but Krotzer fought back to reclaim the lead. Jared Rohrs closed in on the back of Krotzer on the final lap. Rohrs got into the back of Krotzer sending the 31 car spinning in turn four as Rohrs continued on to pick up the checkered flag. Overmyer finished second with Garland recovering to finish third. Krotzer gathered back control of his car to take home a fourth place finish with Donovan Paskin finishing fifth just behind all that actiion. Saturday, July 29, is Raceway Energy’s Night at Oakshade Raceway featuring a regular racing program of UMP Late Models, UMP Sportsmen and Bombers. Gates open at 4pm with racing at 7pm.